What order will my variations post in? My Twitter posts ran out of variations. Now what? Go to Add New Content. Enter your post text and link in the text box. Click the Auto-generate variations button to import variations from most English-language websites. Or click the Manually add variation button to add your own variations. There is no limit to how many variations you can add to a post. Edgar recommends using different headlines, sub-headings, pull quotes, and calls to action when creating variations for your posts. Make variations unique to engage your audience! For Twitter and LinkedIn, be sure to include the link in the text of each variation. If no link is in the text of the variation, Twitter and LinkedIn will NOT display a link or link preview. 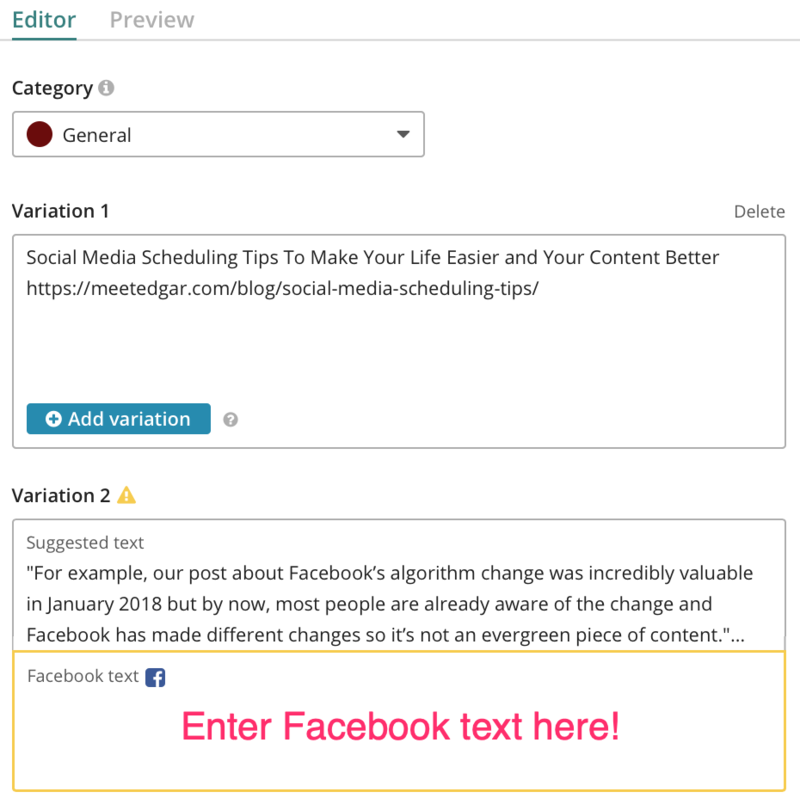 Use Once: If you designate a post with variations as Use Once, each variation will publish one time to each of the social accounts you select. Once all variations have published, the post will be retired and none of the variations will be repeated. Learn more about Use Once. Expiration Date: If you set an expiration date on a post with variations, the post will expire on that date, even if there are unpublished variations remaining. Whether all variations will publish prior to the expiration date depends on how often your schedule publishes that category and how many posts are in the category. 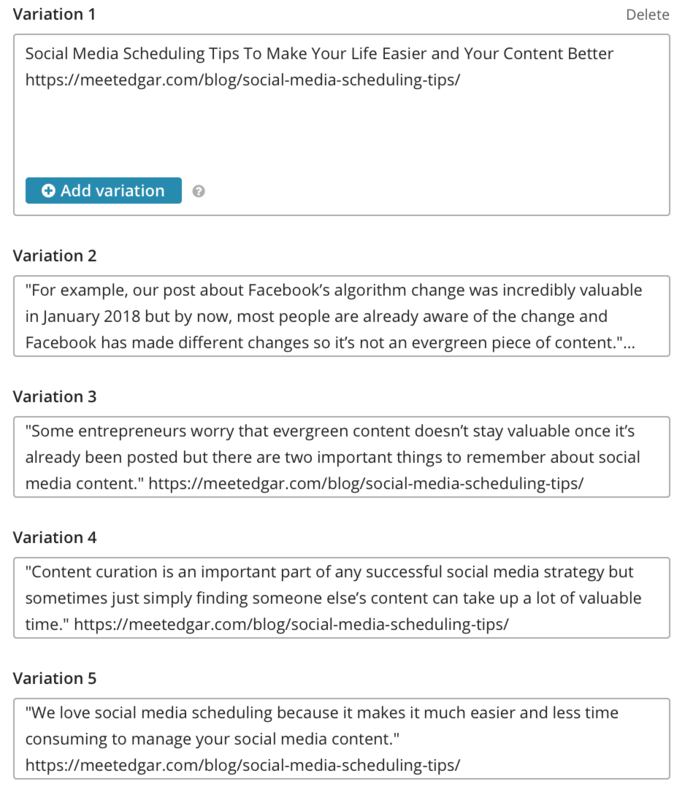 Clicking Auto-generate variations will scrape your link and import up to 4 quotes from the website's text automatically. Edit these pull-quotes to add your own comments or calls to action. And add as many additional manual variations as you'd like. For Facebook posts, be sure to enter text manually into the Facebook text box for each auto-variation. Facebook prohibits auto-populated text for their posts. If you do not enter content into the Facebook text box of each variation, then only the Facebook link preview will publish to Facebook. Learn more. There is not enough text in the link to create variations. The site is in a language other than English. The site may have a firewall or other security software or special formatting that is blocking Edgar's scraper. But don't worry! 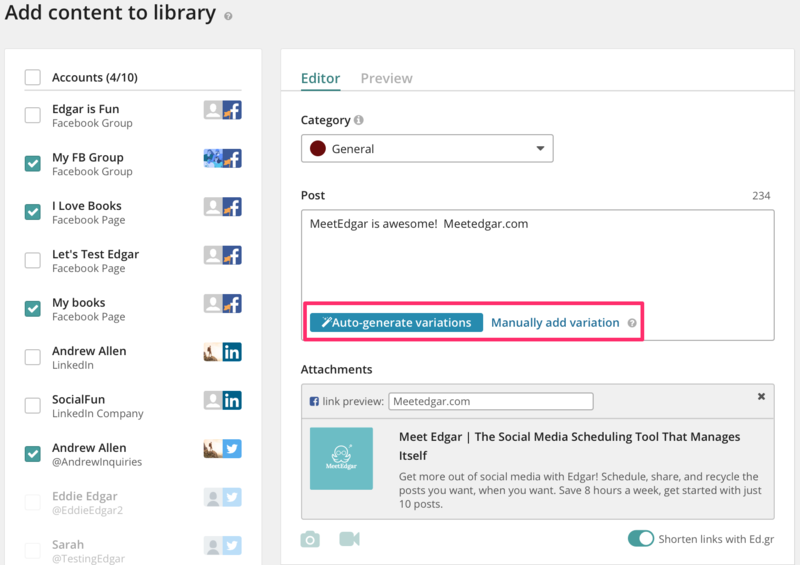 Even if Edgar can't auto-generate variations for your link, you can always manually create your own. By default, Edgar publishes content in a last in, first out order, and your variations are no different. The last variation on any post will be the first one published, and Edgar will work backward through the variations from there. If you choose the Send Now and Save option or the Schedule Send and Save option when you save your post, the last variation on the post will be sent now or sent at the time you selected. Variations on a single post will only publish back to back if that post is the only post in the category. Edit the post and add new variations to reactivate it. Edgar will send you an email notification when he runs low on Twitter content so you can log in and either add new content for Twitter or edit your existing content to add new variations. *Note: this applies to Twitter only. Content will continue to recycle to Facebook and LinkedIn.